Interview with Pablo del Villar, President of the Consejo Regulador of Rueda D.O. 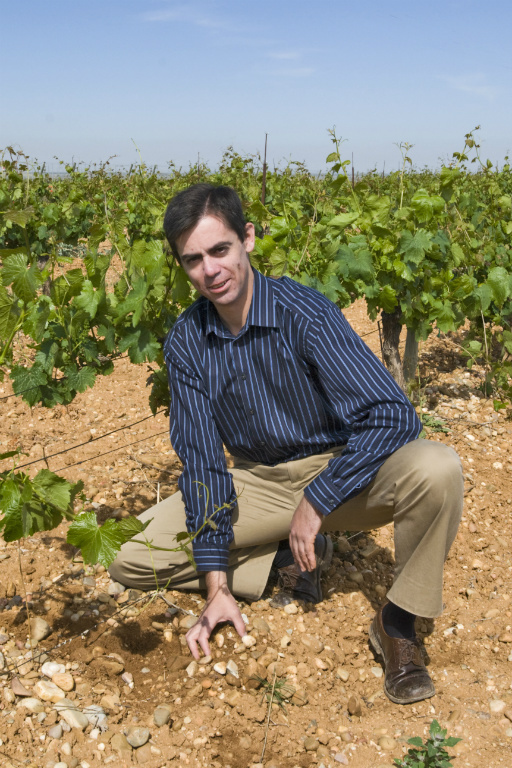 I recently had the pleasure of speaking to Pablo del Villar, of Hermanos del Villar, owners of vineyards situated in the town of Rueda, Spain, in the Rueda DO, northwest of Madrid. He was in New York to help promote his wine, a Verdejo of the Oro de Castilla label, which is being brought to this country by Olé Imports. The winery team with which he works numbers nine persons, of which one is a full-time winemaker—Alberto Martínez, who, though young, is trained and has ample experience. Most importantly for Pablo is that Alberto shares his intellectual curiosity. With respect to issues of blending, style, and so forth, Pablo is the final arbiter—he decides when the blending results in what he wants and then he instructs Alberto on how he wants it carried out. 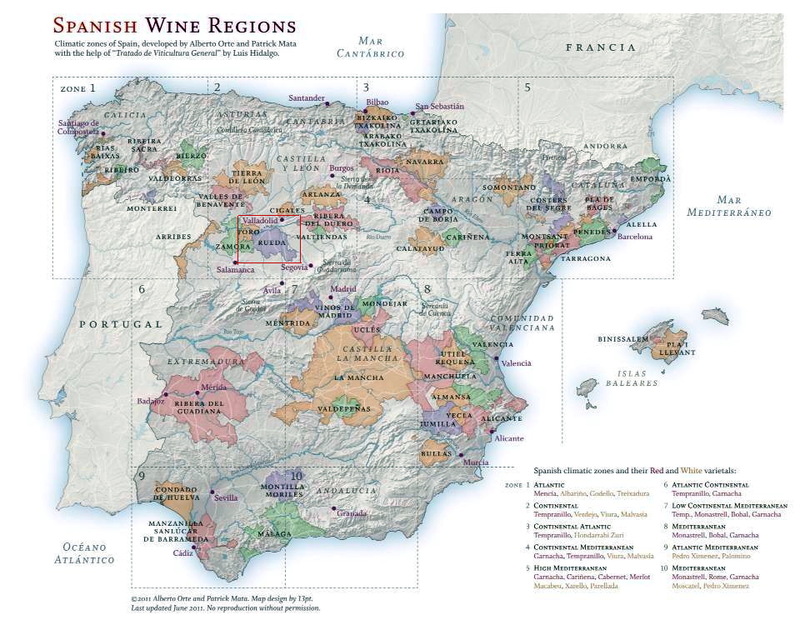 Bear in mind that Rueda is almost exclusively a white-wine region. Its four principal varieties are Sauvignon Blanc—a French variety, Viura, Palomino (used in making fortified wines), and Rueda’s own autochthonous grape, Verdejo, which accounts for about 85% of total production as of 2013. (By comparison, Sauvignon Blanc is only 6%, Viura about 9%, and Palomino has declined from nearly 15% in 1999 to a mere .5% in 2013 and is due to be eliminated.) In fact, white-wine production in Rueda has grown from just over 20 million liters of wine to nearly 90 million in the last fifteen years. Red varieties had been grown in the region in the pre-phylloxera era, but were so devastated by the blight as to nearly disappear, but even today the production of the most-widely planted red grape, Tempranillo, represents barely 1.5% of overall wine production. Rueda did not achieve official DO status until 1980, because until Marqués de Riscal invested heavily in a winery there in 1972 to produce Verdejo, the region had largely been making bulk wine. That it now enjoys DO status shows just how great a turnaround the region has accomplished. The Rueda D.O. is boxed in red. Click on the image to see an enlargement of the map. 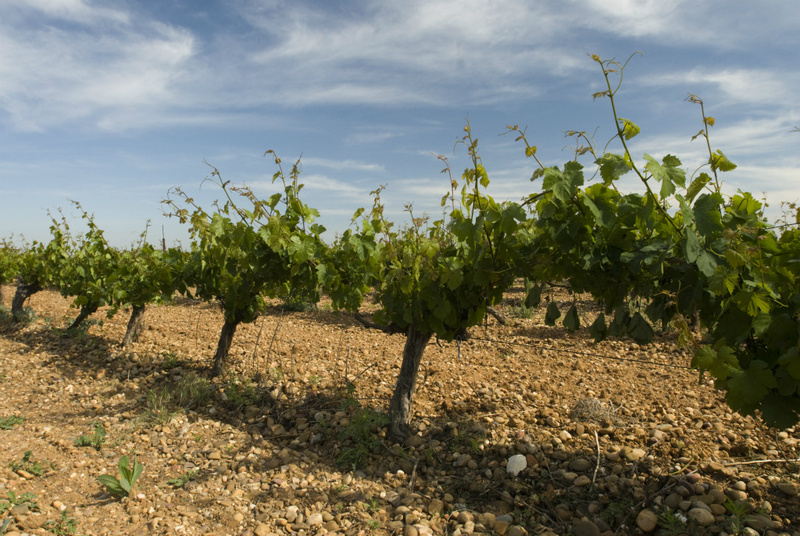 Of all the producers of Verdejo wine, Hermanos del Villar has achieved something unique—acclaim for the Oro de Castilla as a “model” for the variety. Since 2007 it has consistently attained a 90-point rating from Steve Tanzer’s International Wine Cellar. 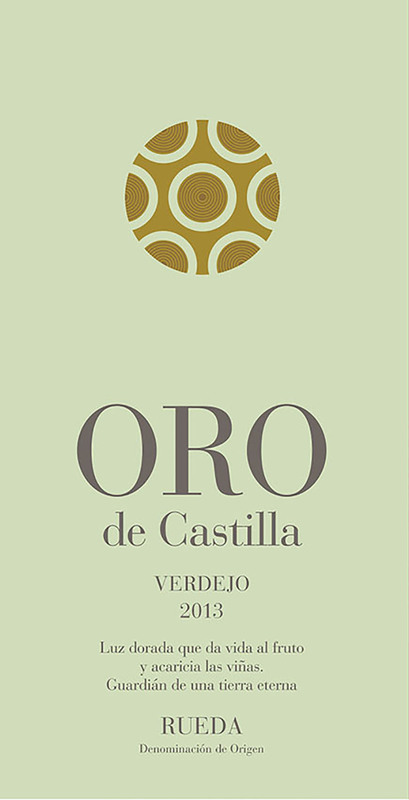 There is also an Oro de Castilla Sauvignon Blanc which, though similar to the Verdejo, is more mineral in character and also has tropical fruit notes. For Pablo and the winery, “the entire point of making their wines is to extract everything that the grape offers without modifying it.” Most of the work to make the wine is in the vineyard. At present there are 120 hectares (about 305 acres) with plans to plant another twelve or so, with 2,200 vines per hectare (or barely 900 per acre, which indicates fairly wide spacing). In the case of the Hermanos del Villar vineyards, the vines are trained on double-Guyot trellises; other vineyards in the region may plant using the vaso or goblet system, but at an even wider 1,100 vines per hectare (450 per acre). The reason for such wide spacing has to do with the terroir of the region, which is semi-arid, with high temperatures in the summer and very low ones in winter, along with a diurnal temperature range that is typical of high-altitude vineyards. Consider, after all, that all the rain is concentrated in the fall and winter seasons, while the vines have to survive most of the spring and all summer with little or no rainfall at all. Another factor to consider is that the very stony soil doesn’t really hold on to moisture very well. Nevertheless, while there is vine irrigation in place, it is used primarily to help regulate the acidity of the soil rather than to raise production levels. Indeed, even though the Consejo Regulador of Rueda allows up to 10,000 kilos of fruit per hectare to be harvested (about 10,000 pounds or 5 tons per acre) Pablo says that they self-regulate the amount to be harvested to 7,500 kilos (about 3.5 tons). Pablo considers the 10,000 kilo limit as excessive for producing quality wine. When harvesting the grapes, they aim not for a particular level of Brix in the fruit, but rather an aromatic ripeness, which usually leads to about a 12 to 12.5% of alcohol in the wine. (In other words, the focus is not on the sugar level, which may mislead the harvester to think that a level of 23 Brix will mean a phenolically mature grape, which may or may be the case.) The grapes are harvested by machine at night, when there are low temperatures and no sunlight to affect the fruit. The equipment is designed to bring the grapes to the winery clean of stems and leaves. One advantage, therefore, is that there is little need to chill the fruit before it goes into the fermentation tanks. Much of the fermentation takes place at 13°C. (56.6°F.) and some occurs at as low a temperature as 5°C or 41°F. The resulting wine is then aged on its lees in stainless-steel tanks. The lees are stirred for two reasons: one is to add complexity to the wine, and the other is to let it age better once in bottle, though of course it is meant to be drunk young. The 2013 vintage was exceptional in Rueda, thanks to outstanding weather conditions with hot dry days and very cool nights as the harvest approached, resulting in elevated acidity and deep fruit flavors in the grapes. The harvest took place on the night of September 28. I can speak to the quality of the 2013 Verdejo myself, having had the opportunity to taste it twice. The first time it was shared with friends over dinner, accompanying roast Cornish Game Hens. It was an elegant pairing, given the slight sweetness and subtle flavor of the birds which was offset by the bracing acidity, some minerality, and fresh citric aromas and flavors of the wine—along with a herbaceous character all of which is very much like a Sauvignon Blanc. In fact, the wine evolved in the glass to yield delicate notes of white peach. The second time I tasted it alone and then with my wife with arctic char served with dill—it was a superb accompaniment again and for the same reasons—it balanced the sweet and delicate taste of the fish as well as any white wine could hope to match. The 2013 is a wine that will age gracefully for a few years to come. It is these characteristics that make the Verdejo of Oro de Castilla a “best example” of the variety according to the Spanish Wine Academy; Josh Reynolds of Steven Tanzer’s International Wine Cellar says that it is “a textbook Verdeho.” I myself would describe it as a “very model of a modern, major Verdejo.” (Thank you, Gilbert & Sullivan.) Its retail price in wine shops will be around $17. For a thoughtful assessment of the future of the Rueda DO, read this blog post on the Decanter Website. This entry was posted in Vineyards, Vinification, Viticulture, Wineries and tagged Consejo Regulador de Rueda, Duero DO, Hermanos del Villar, Ole Imports, Oro de Castilla, Pablo del Villar on 5 May 2014 by JoseM-L.
My husband and I enjoy wine, but we are not connoisseurs, sometimes exploring various regions for fun. We traveled to Burgundy, Rhone, a bit in Bordeaux, Napa… Great wine is like a joy potion.